DANCING WITH THE LADY IN BLACK: Ron Hornaday has met “The Lady in Black” known as Darlington (S.C.) Raceway as he has competed in both a Cup Series and Nationwide Series vehicle at the 1.366-mile track. However, as the Truck Series makes a triumphant return to the track “too tough to tame,” Hornaday embarks on a new journey himself, tackling the “lady” in a truck. 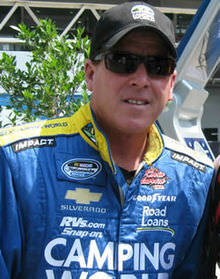 Hornaday will make his first Truck Series laps around Darlington Raceway on August 14, 2010 when the Truck Series returns after a five-year hiatus. WELCOME E-Z-G0: Not only will Hornaday be making his first laps in a truck around Darlington Raceway, he will also be sporting new colors on the No. 33 Chevrolet. E-Z-GO, a Textron company, will join Hornaday and the No. 33 team for the first time in 2010 at Darlington Raceway. The Atlanta, Georgia based company, which sponsored Kevin Harvick for his second Truck Series win of 2010 at Atlanta Motor Speedway and Ken Schrader at Kansas Speedway earlier this season, will unite with Hornaday at Darlington for the first of seven primary races this season. TAKING YOUR TIME IN THE 2FIVE: Hornaday’s new sponsor partner E-Z-GO will be debuting their new street legal vehicle, the 2Five, on the quarter panels on the No. 33 truck this weekend at Darlington. The 2Five is the first street legal golf car. It is named the 2Five because it will travel up to 25 miles per hour (mph). If Hornaday traded in his No. 33 E-Z-GO Chevrolet, which will travel at a top speed of approximately 160 mph for the 2Five at Darlington, it would take him eight hours to complete the 200-lap event. 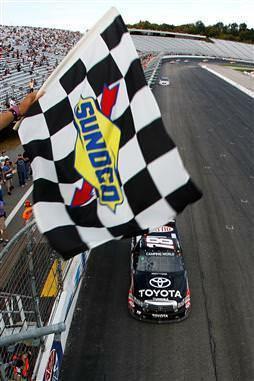 GOING FOR 5-0: Hornaday is the all-time wins leader in the NASCAR Camping World Truck Series with 46 wins. Hornaday looks to become the first driver in Truck Series history to record 50 wins. CHASSIS HISTORY: The No. 33 E-Z-GO team will take chassis No. 048 to Darlington Raceway. Chassis No. 048 took to the track last weekend at Nashville (Tenn.) Superspeedway, where Hornaday earned his eighth top-10 finish of 2010. PREVIOUS RACE RECAP: Last weekend at Nashville Superspeedway, Hornaday and the No. 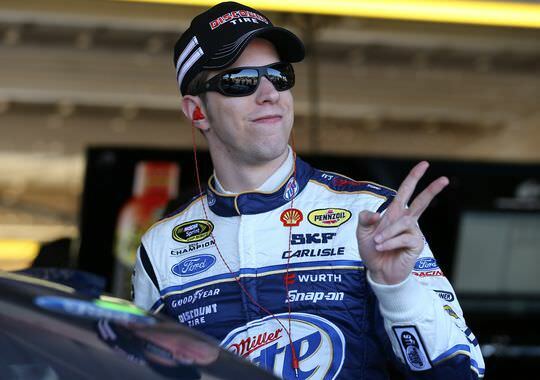 33 team scored their fifth consecutive top-10 finish at the 1.33-mile Superspeedway with a sixth-place finish. ARE YOU A FOLLOWER? Twitter users can now keep up-to-date with Kevin Harvick Inc.’s NASCAR Camping World Truck Series teams by following at http://twitter.com/KHI_TruckSeries. In addition, you can follow KHI’s Nationwide Series team at http://twitter.com /KHI_NNS. Want more from KHI? Follow KHI’s co-owners Kevin and DeLana Harvick at http://twitter.com/kevinharvick and http://twitter.com/delanaharvick. E-Z-GO, a Textron Inc. company, is a leading manufacturer of golf cars, utility and personal transportation vehicles. Products sold under the E-Z-GO brand include RXV® and TXT® fleet golf cars, Freedom® RXV and Freedom TXT personal golf cars, ST personal utility vehicles, Shuttle personnel carriers, and MPT turf-maintenance vehicles. E-Z-GO also produces the Cushman® line of heavy-duty material carriers. E-Z-GO is the preferred golf car fleet provider for many of the world’s most revered golf courses, clubs and resorts. E-Z-GO is also the golf car of choice of nine of the nation’s ten largest course-management companies. E-Z-GO boasts the largest sales and service network in the industry, with more factory branch locations and independent distributors than any other manufacturer of golf cars and utility vehicles. Textron Inc. is a multi-industry company that leverages its global network of aircraft, defense, industrial and finance businesses to provide customers with innovative solutions and services. Textron in known around the world for its powerful brands such as Bell Helicopter, Cessna Aircraft Company, Jacobsen, Kautex, Lycoming, E-Z-GO, Greenlee, and Textron Systems. More information is available at www.textron.com. About Kevin Harvick Inc.:Kevin Harvick Inc. (KHI), established in 2001 by Kevin and DeLana Harvick, is an 80,000 sq. ft. facility located in Kernersville, N.C. Home of the 2009 NASCAR Camping World Truck Series championship team, KHI enters 2010 in its seventh full year of competition with two full-time Truck Series teams and one full-time Nationwide Series team. Four-time Truck Series champion Ron Hornaday returns to the helm of the No. 33 Truck team looking for his fifth title and third championship for KHI (2009 and 2007), while Sprint Cup series stars Kevin Harvick and Elliott Sadler guide the No. 2 Truck team. Two-time NASCAR Nationwide Series champion Harvick will again shine as the lead driver of the No. 33 Nationwide Series team as he continues to make his mark in motorsports and establish KHI as one of the top teams in NASCAR competition. For more information about KHI and its teams, please visit www.KevinHarvickInc.com.